How have you all been doing? It's spring here in Germany or at least that's what people say - but snow in spring??? aarghh!!! And thus the new project has started... Here are some pics. The picture quality is poor due to the weather, sorry. Since I've not embroidered letters as much as I would like to, I started with searching for quotes and finally ended with "Hope". Don't ask me why. 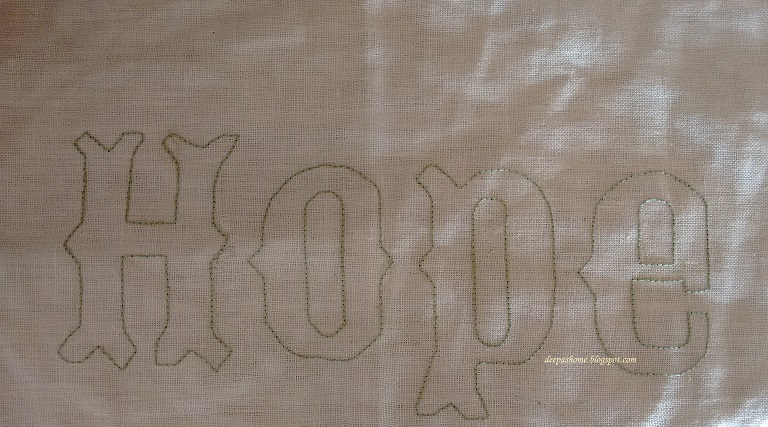 My daughter asked the same question - why hope, amma ? Why not Luck,Love or Smile?.....sigh!!!! questions!!! 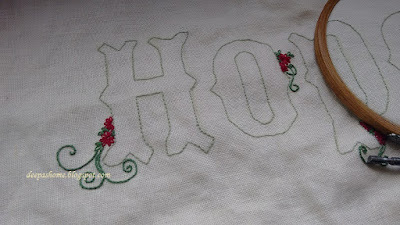 In negative space embroidery, the work is on the outside and the inner space remains blank.So to distinguish between the outside and the inside, I outlined the letters with a pale green in back stitch. I've slowly started embroidering on the outside and this is how it looks now. Not much, I know..but I'll get there :) Since there's no drawn design, each element needs to be thought out. Had this been a heavy outline with a bright color, I think I would've been happy with just a few more bunch of flowers strategically placed. But since I am going negative, a lot more filling up is needed. Well, let me add some more and we'll see how it looks. looks interesting. "hoping" sunshine for you :) you've done winter already! Looks great Deepa - I love those little flowers peeping around the letters. We had ice pellets yesterday morning when we woke up - yuck. Enough already! Yes, Spring in Europe has been a bit wild. Hoping for good weather seems a good thought! liking what you are doing here and hope is a good word also like peace. Sorry you are getting more winter in Spring. Another blog friend in The Netherlands, and another in Canada are complaining as well. Oh, I hope you post progress pictures!! I love negative space needlework. I have never done a piece, but think I would like to.